Shark fishing is one of the most action packed experiences you can have out in the open ocean. These apex predators prove to be a thrilling catch, but you don’t need to be Captain Quint to battle massive sharks on our Cape Canaveral shark fishing charter. 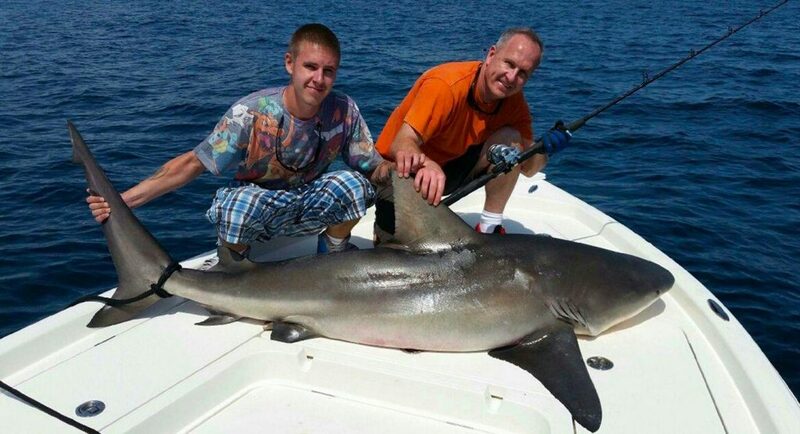 Here is some shark fishing information for anglers of all ages and abilities. There’s blood in the water! No, really. Chumming is key when it comes to shark fishing. Chumming is a type of scent trail that shark fishing charters use in order to attract sharks to the boat. Chum is a bait typically made up of fish parts, blood, and bones. Sharks have a keen sense of smell, and they’ll be following that chum trail straight to the boat. Sharks love warm water, a good shipwreck, and plenty of fish. Off the coast of Cape Canaveral, several wrecks and natural structures can be found housing the ocean’s greatest predator. With water temperatures in the upper 60’s, schools of fish nearby, and structures to hide in, you’ll be able to find sharks cruising for their next meal. The chum line will bring the sharks to the boat, but the rest is up to you. When the shark takes the bait, it’s best to wait a good five to ten seconds before you hitch up and start reeling. A few good tugs should set the hook, and you’re on your way to pulling in a massive shark. Other safety precautions when bringing the shark into the boat include: securing the tail with a rope so it doesn’t thrash around and do some serious damage, removing any rods or other materials from the shark’s landing area, and not putting your hands or fingers anywhere near the shark’s razor-sharp teeth. If you’re searching for your next big adventure, look no further than Fin and Fly’s shark fishing charters off the coast of Cape Canaveral. Book your charter online or by phone with Fin and Fly fishing charters and have an unforgettable adventure battling your very own Jaws.